A Must-See, beautifully maintained, model-like home that sits on nearly a Â½ acre private lot in a cul-de-sac. 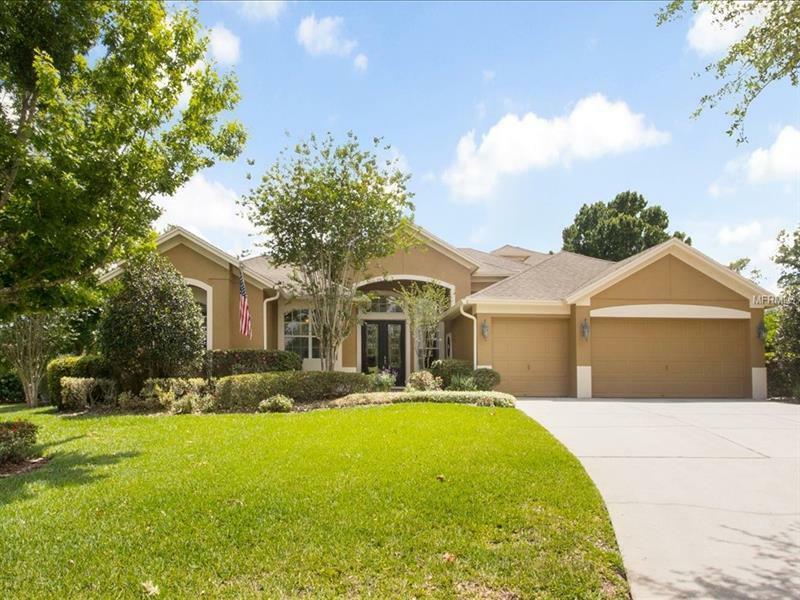 This home is a gorgeous, move-in ready, 5 bedroom, 3 bath home (5th bedroom being used as an office) with an upstairs bonus room that comes complete with a wet bar and the pool table stays! As you enter this elegant home, you are greeted by the warm formal living room with soft neutral colors, hardwood floors, soaring ceilings and long, custom drapes and the dining room is to the right of the entry. This home has a split-floor plan with a spacious master bedroom with custom his/her closets and master bath. The secondary bedroom exudes privacy with a full bath next to it and the other two bedrooms share a Jack and Jill bath. The kitchen offers 42â wood cabinetry, stainless appliances, solid surface counters, an island and a breakfast nook. The kitchen opens up to the cozy family room with hardwood floors and a wood, built-in entertainment center. The kitchen and family room both walk out onto a screened, paver patio and lanai with a large spa. This is a great entertainment space for dinner parties and sitting around a fire pit. The best feature of all is the large, private backyard for the family to play and with plenty of room to add a custom pool to your own specifications. More great features include, whole house surround system, Kinetico water filtration system and epoxy floors in the garage. Lake Forest offers a guard gated community with resort style amenities.